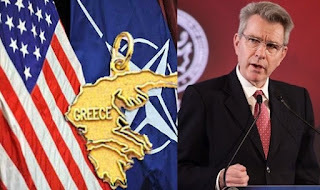 The U.S. ambassador in Greece Geoffrey Pyatt made some quite revealing remarks about the interest of the United States regarding the strategic role of Greek ports and maritime industry, during a speech at the 17th Navigator Maritime Forum. Commenting on Prime Minister Tsipras' recent visit to Chicago and Washington, he said it strengthened Greek-U.S. ties and that "the message Americans heard throughout the visit, at the very highest levels, was that Greece is back, open for business and a pillar of stability in its region." Pyatt said this partnership includes enhanced bilateral Investment cooperation, including an overall strategy where Greece serves as a regional hub and supplies energy from diverse sources to Europe, spurred by increased U.S. investment in this sector, as well as U.S. investment in Greek shipping, ports, and shipyards. "In particular, I hope we will be able to celebrate a major U.S. investment in the Syros shipyard in the very near future," he said, referring to U.S. company ONEX which has expressed an interest in investing at the Syros shipyard. "I am glad to see that deal making progress and look forward to celebrating a major U.S. investment there in the coming weeks," he added. The ambassador stressed however that privatizations of state-owned assets must be done in an open and transparent way, based on free and fair competition. "We saw this here already with the privatization of the 14 regional airports, where the winning bidders had a known track record of doing business in Greece and Europe. It was clear where their financing came from and who their shareholders were," he said, referring to Fraport's deal to manage and operate the airports. "An investment and privatization system based on transparency and the rule of law will help build confidence in Greece as an investment destination, and create momentum that can sustain the Greek economic rebound. I am confident that if Greece continues to commit itself to building such an environment, American investors will take a fresh look at Greece," he said. 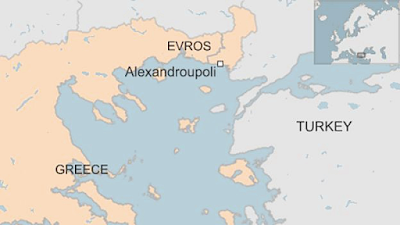 The U.S. is also interested in the port of Alexandroupolis, he continued. "The strategic position of this port is on full display right now: elements of the US Army's 10th Combat Air Brigade are using it as a staging area for Blackhawk helicopters and cargo moving back to the U.S. from Romania- demonstrating, as I discussed with the Mayor of Alexandroupolis this summer, the potential of that port to play a much bigger role in regional infrastructure and connectivity," he said. "Like a government spokeman, U.S. ambassador in Greece announced the transformation of part of the Alexandroupolis port into a U.S. military base, while, for two weeks, the SYRIZA-ANEL government is defiantly silent towards the KKE questions about the agreements with the Trump government. Seems that Tsipras' trip to the U.S. starts to bear fruits, the extend of the "political striptease" of shame begins to unveil and the government must inform the people about all the commitments it undertook. Mainly, however, the Greek people must fight these shameful agreements which involve them in big dangers, within the frame of NATO-USA-EU imperialist plans in the region that go hand by hand with the overall antipeople policy".